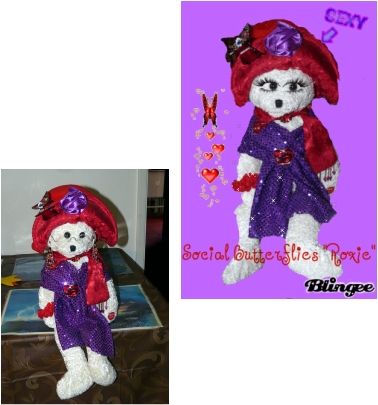 "Roxy" was donated to SB by our member Irene in 2011. She got her earrings also from Irene!!! ﻿Our own VQ Pam made this beautiful SB all beaded display for our group for our table with our mascot "Roxy" in 2016. If you have not seen it be sure to look for our "SB" table at our events to see it close up. 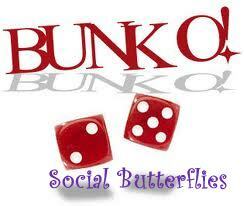 "Bunko" graphic design by QM 2012 copyroght protected. 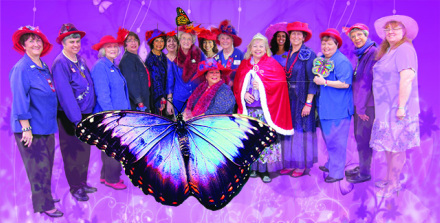 Cathy Stanfill designed this wonderful Christmas photo in December 2012 for the Social Butterflies. The background was taken of VQ Pam's Dept 51 Christmas Village in her home at our 2012 Christmas party. The Santa in the chimney was taken by Cathy from the train festival in December 2012. She inserted all the members into the village as if we were actually there. What a wonderful photo. Thank you Cathy, we will post it on our "home" page every year. SB official logo was designed by our past member Janet Balstad to represent the SB. Our initials formed into a butterfly. Our logo is on all our "member's" apparel and chapter affiliated items and business paperwork. It is copyrighted. designed for QM & SB in 2011 is copyright protected. used larger with motion or smaller with none. It is a wonderful experience that SB sisters feel when they meet up with other RH sisters and feel the warmth of the SB "kisses" of friendship and sisterhood! SB welcomes all with "open arms"
and the warmth of SB friendship! 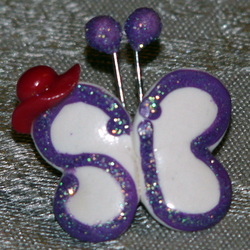 Send a SB "Butterfly Kisses"
or may just need a HUG!!! 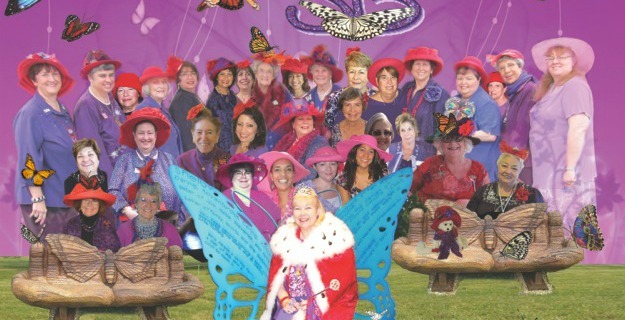 RH sisterhood quality extending RH sisterhood to any of our members! 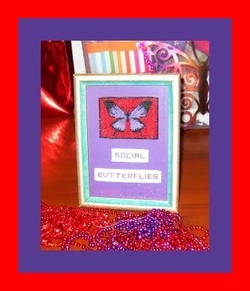 Have you had a "A Social Butterflies Kissses"
Experience with any RH Member? Tell us all about it and we will post it here!! Q Cathy Stanfill of RRC. [a previous member of SB] She did a fantastic job making sure all our SB members were included in the banner photo. Thank you so much Q Cathy for all your hard work and talent!!!! If you scroll down you will see several photos made of our SB. ​Click on the photos and they will get larger for a clearer view. 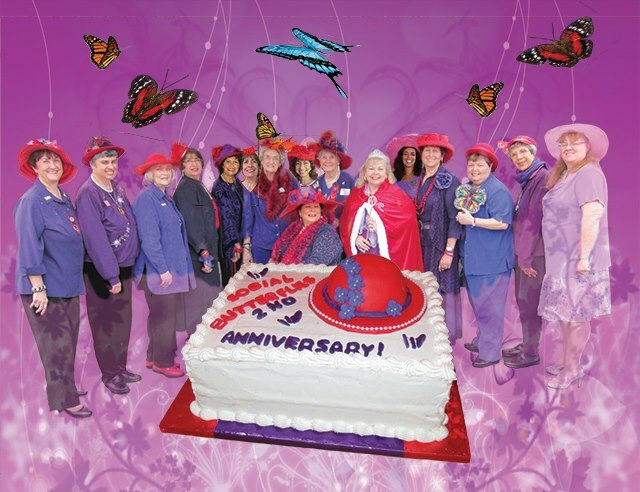 Group photo with most of our members in 2014 with our Anniversary cake, created by our very own talented Gloria Reediger. Thank you!! !